Divorce lessons from someone who knows a thing or two about divorce! Home » Divorce lessons from someone who knows a thing or two about divorce! One of the things we found about going through a divorce was that it gives you an insatiable interest in other people’s experience of it. We join the divorce club and swop stories. 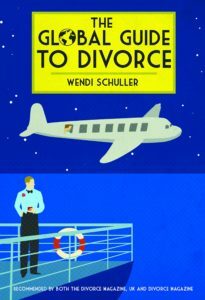 But it’s also an opportunity to learn and grow and who better than to learn a thing or two from than Wendi Schuller, author of The Global Guide to Divorce. So tell us a bit about your divorce. How long were you married? Was it a shock or was the writing on the wall? I was married for two decades and realized early on, most likely we would not be spending our golden years together. I grew to not like or respect my spouse. Divorce seemed best after the youngest flew the nest, but luckily it happened sooner. When the boys and I were going away for a long weekend, I found a post-it note in the bathroom from my husband, saying he was leaving me and I lost my job (we worked together). I went into shock. My sons read the note too and started jumping up and down and screaming for joy. It is better when a spouse does not receive “I’m leaving you” the same time as the children. It helped that the kids were so happy at the news, because I could barely function. Is there anything you’d do differently or anything you slightly groan at looking back? I would have gotten a divorce sooner and not asked my mum what she thought. Follow your own intuition and go to a professional, such as a life coach to talk over your situation. My mum insisted that her grandsons needed a father in the house. Instead, they got unhappiness. Being grounded and getting into a calm state helps one to take better actions. I was so flustered which resulted in not getting some cherished items out of the marital home. I was told by the workman renovating the house, that he would deal with what we left behind. Do not act in haste. What, in your experience is the most common mistake people make when it comes to divorcing? There are many mistakes made and a common one is putting everyone else’s needs ahead of yours. If you collapse or have a breakdown you will not be a help to others, or to yourself. As instructed on the airlines, put your oxygen mask on first before helping someone else. Do the same in divorce. This is the time to learn to say “no” and drop time-consuming obligations. Do not be stoic. People going through divorce sometimes do not reach out to others. Let them nurture you and give support. Ask for help. Perhaps ask for a friend to have your child over, so you can take a nap or read. Get some me time. What do you think is the difference between people who get over it fastest and those who don’t? This is a generalization. People who wanted out of the marriage often get through divorce faster emotionally. When a divorce announcement comes suddenly, it takes time and energy just to process it. Moving on comes a bit later. Another factor I have witnessed, is optimistic individuals have adjusted to divorce and moving on a bit quicker than ones who have a gloomier outlook. Miscommunication – surely part of every divorce!! – do you have any advice or stories to offer on this. Miscommunication is more apt to happen when strong emotions get in the way. Keep all communication business-like with your soon-to-be ex, as you do with colleagues and clients on the job. Stick to the facts. Avoid trigger words like “you always” or “you never.” Instead, politely state your request. Use technology to lessen direct contact. For example, an online calendar for co-parents, allows each one to update a child’s activities and events. It is each parent’s responsibility to check it and avoids blaming the other parent of not notifying them of something. Do not gossip about the other person. Stories have a way of getting back to the subject and can get exaggerated along the way. Social media is off limits regarding divorce updates or stating opinions of one’s ex. Do you think men handle divorce differently from women? Yes, from what I witnessed during my divorce and the interviews that I did afterwards. Men were more playful and did not focus on their divorce 24/7 like my female pals and I did. It was like they have compartments in their brains and could shove their divorce away for a while every day. Men told us to let go and have some fun. Great advice. The men would talk about their divorce proceedings and then go on to something else. We women tended to analyse various aspects and keep discussing it. I took their advice and went to comedies, and played more with my sons. Thanks guys. I was in a parenting class with both genders during divorce and we saw the other’s points of view. That helped me. How has getting divorced changed your life? I have a close relationship with each son that was not there when I was married. I was in survival mode before my divorce and that took up most of my energy. I have freedom and can have a more fulfilling life. I ran our business and was trapped in that job. We at Divorce Club believe that divorce although tough, is an opportunity for growth and can lead to a better life. Have you seen that with the divorcees you’ve met? Tell us your take on it. Divorce motivates one to start a new chapter in life. The stories I read about entrepreneurs, show many started their business after divorce. Other writers and artists really got going on these careers after their divorces.Divorce gives the opportunity to try something different and rediscover one’s passions. I am not bound to someone else’s schedule and live my night owl life and write until 3 am if I choose. When not under the stress of a troubled marriage, my creativity has exploded in to new areas. I am a much happier person post-divorce. You’ve written a cracking book on divorce: The Global Guide to Divorce. How are you involved with divorce now? What does the future hold for you? I am starting to collaborate with others in the divorce world. For example, I wrote a small piece in a therapist’s co-parenting book that was published recently. I got asked to talk with educators on how to deal with divorce in the school setting, since I was a school nurse for nearly a decade. I worked with divorce situations in schools. I want to do workshops and am looking for employment in a law firm or divorce organizationto help their clients cope with divorce. I am working on some new projects. I get e-mails from people around the world with questions regarding divorce or moving on. I see myself as being an agony aunt and would love to do it professionally. Divorce has opened many doors for me and this is an exciting time in my life.